Unfortunately, you don’t often get a chance to travel to a choice spot and hang out next to your camera as it snaps away for several hours. Well, with the recent daylight savings time change combined with the fact that I literally have mountains in my back yard, I am presented with the perfect opportunity nearly every day. So, last night as I laid down to sleep I crossed my fingers and hoped that I would have enough willpower to resist pecking the snooze button. 1. Once you set it, DON’T TOUCH IT! Haha, if you watch closely, you will notice that I made a mistake that I knew I was making when I made it!!! I brought an ND filter with me – which stands for Neutral Density and is basically a rotating filter that makes everything dark. It is particularly useful for bright days or shooting sunsets… IF YOU DON’T MESS WITH IT WHILE YOU’RE SHOOTING. I don’t know what I was thinking, perhaps it was the early hour or the fact that I just sprinted up a frozen hill to catch this sight. As the camera shot away, I looked into the viewfinder and thought to myself that it would look better to make it darker as the full sun revealed itself. The result, however, is the video dimming unpredictably and inexplicably. I mean, I could try to fix each individual frame… but that’s not an effective way to shoot time lapses. Well, one of the things that is important to keep in mind is the number of images you’ll get. For example, if they standard TV frame rate is ~29 frames per second, that means 15 seconds of a smooth timelapse are 29*15 = 435 images. Now, if you’re shooting at 10 second intervals, that means you will have to shoot for 435*10 seconds = 4,350 / 60 seconds per minute = 72.5 minutes, or 1 hour and 12.5 minutes. For 15 seconds, that’s a load of work and I still find myself failing to grasp this concept. So, when you plan on getting out, make sure to bring a lawn chair and a good book, or a good friend who needs an ear. This was actually an accident. For New Year’s Eve, as I do every year, I went camping on top of a mountain solo. In the process I found the ideal spot to set up my tent and got to work, but not before setting my camera up. Unfortunately, I realized too late that my camera settings were adjusted for the bright blinding light of the sun illuminating falling snow through thin cloud. As a result, my camera produced a blur for anything that was moving. Well… once I ran the timelapse through my computer, I was pleasantly surprised that it totally fit the scene as I was buzzing about setting up my tent. Um, I mean, it was totally intentional! But when you do… oh boy does it work out! That said, as you can see on the first point above, I’m still finding myself making rookie mistakes after years of practice, and I don’t want you to think that this is easy. Messing up one photo is not a big deal because you can snap a couple more soon after, but messing up a time lapse wastes several hours of work, not to mention the effort it took to get into position! Just don’t be hard on yourself, and keep at it – and most important of all, MAKE SURE TO TAKE OFF YOUR LENS CAP! 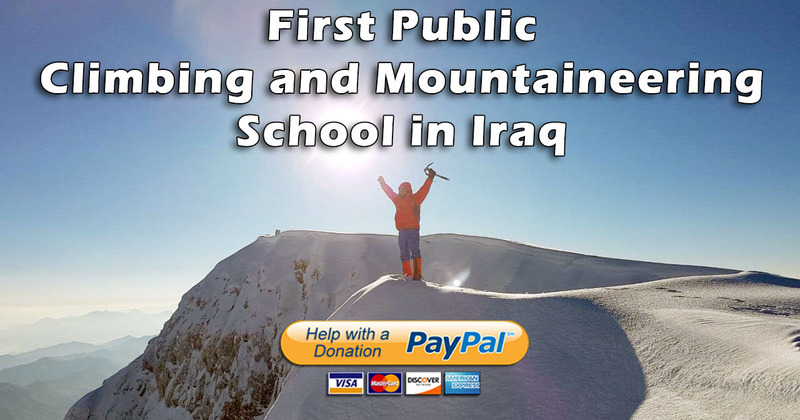 You should totally check out our project to Build the First Climbing School in Iraq! Click the image below to learn more, and please consider making a donation!